In the last couple of days there's been several rumours circulating that Apple is preparing to kill off the iPad mini. It was also discussed on ATP, one of my favourite tech podcasts. The reasoning is based on the device's lack of recent updates, its price compared to the recently introduced iPad and because of speculation that its sales have declined. As a user of an iPad mini 2, I'll be disappointed if this happens. The mini had an interesting beginning. It was Apple's hasty response to the then surge in popularity of the 7-8 inch Android tablet market fuelled in part by the popularity of the Kindle, Google Nexus 7 and similar offerings from Samsung. This was a few years before the dominance of phablet phones. I myself was drawn to this class of tablet because of my daily commute--often requiring me to stand in Melbourne's overcrowded trains. I bought the original Nexus 7, which on paper was better than the original iPad mini but Android never lived up to it's promise as a tablet OS. A couple years later, when one of my kids cracked the screen of the Nexus, I bought an iPad mini 2. The mini 2 was a significant upgrade over the original mini. It was essentially a shrunken down iPad Air, replacing what was previously an iPad 2 in an 8 inch shell. 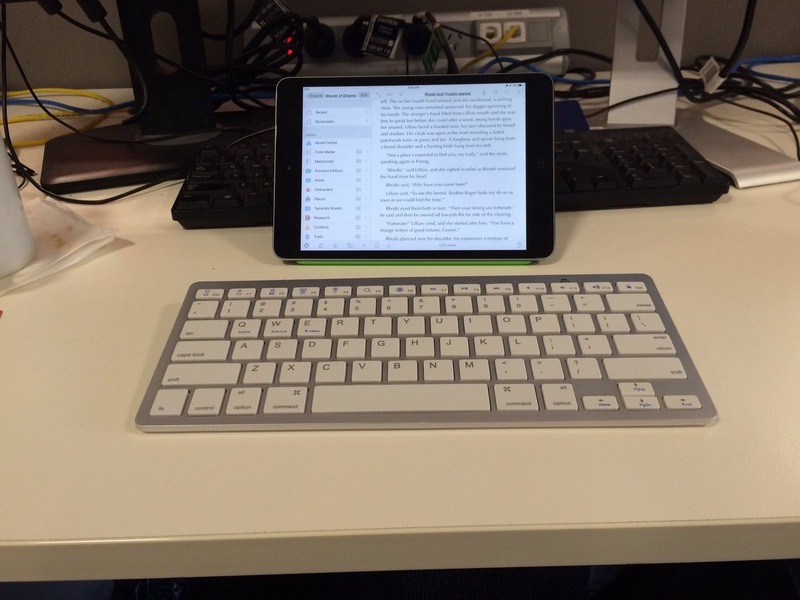 iOS was much better for tablet apps and I had in the back of my mind that Scrivener would one-day climb out of development hell and let me write on the thing. I immediately fell in love with it. It is perfect for my commute; I can easily store it in a jacket pocket and use it standing up with one hand. The retina resolution makes it great for reading (though the non-laminated display is not as good as my wife's iPad Air 2). It became my go-to device for reading, YouTube, browsing and email. Moreover, I quickly adopted iOS as a productivity platform thanks to Apple Notes, Editorial, Pythonista and Terminus. When Scrivener for iOS came out, it easily met my expectations and hastened my abandonment of Linux on the desktop and my return to the Apple fold. Needless to say my love for the iPad mini puts me in an awkward position because I've it seems that I backed the horse in that came last. When the mini 4 was released, I held out because the mini 2 was still performing well and I was hoping Apple would release a mini 5 with an A9 processor. That never happened and looks like it won't. Instead, Apple dropped all but the 128GB iPad mini 4, which now retails for just $20AUD cheaper than 128GB version of the new 9.7 iPad. Meanwhile updates to iOS have slowed the performance of my mini 2 for some tasks. I would like more storage and I'd definitely appreciate a better display with less reflection and less parallax. So what are those of us who prefer the form-factor of the mini line to do? On paper the new 9.7 inch education-oriented iPad looks like the better buy. However, it doesn't offer a laminated, low-reflective display or the highest pixel density. It's bigger than I'd like. On the other hand, the mini 4 is running old hardware and clearly, Apple wants it gone from the line up. Buying the mini 4 doesn't seem like the right thing to do--although, I'm bloody tempted to do so before it disappears. The only other direction is up...hello iPad pro. Well, that's a $420AUD price jump into a device category that I'm not sold on. Still, the size is something I think I could cope with--using my wife's Air 2 feels luxurious and the 9.7 inch form factor is much more conducive to productivity. But still, $999AUD...for an accessory device is a bitter pill to swallow. Tiresomely, I went through this (not-so internal) debate last year. I almost bought the 9.7 inch iPad pro, figuring that I'd get a pencil for drawing and keyboard case for writing. It was only the well-reasoned arguments of my wife that convinced me I'd be happier with the MacBook Air. She was right; the MacBook Air fits my needs perfectly as a productivity device. I'm a power user who loves keyboards and their short cuts, the command line, file systems and shell scripting. When I use macOS, I feel like the conductor of a well-tuned symphony orchestra with every instrument under my complete control, working together harmoniously. By contrast, iOS and iPads feel like an opinionated appliance that I can only use in the way Apple intends. Even though I use my iPad mini a lot, deep-down I still think of the iPad and iOS as an accessory mobile device. That might--and likely will--change in future, but for now at least I'm not prepared to invest that much into iOS beyond what I need: a portable reading device that can serve as an adequate mobile typewriter at a pinch. I'm content with my iPad mini 2; sure an upgrade would be nice but I don't need a better one and I suspect I'm not alone in my decision to hold off and be content with what I have. As I write this, part of me wonders if the fate of the iPad mini is the canary in the coal mine. There seems no end to the year-on-year decline of iPad sales since their peak in early 2014. Apple is now selling less iPads per quarter than they did in 2011. People aren't replacing their iPads with newer iPads. Old models like mine (and even offerings from competing vendors) are more than adequate for the majority of use cases. Apple is ruthless and it's not hard to imagine a world where the iPad is no longer economically viable. Three years ago, iPads dominated the devices used by my fellow commuters but today, their numbers have been thinned by bigger phones, Windows hybrids, Samsung tablets and clamshell laptops, which never really died out despite the tablet hype. Funnily enough, a laptop is still the most ergonomic and efficient form-factor when using your lap as a table. The slow death of the iPad mini is making me hesitant to invest too much into iOS. Having decided to wait and not buy the iPad mini 4, I'm in no rush. I don't want to spend money for the sake of it. When I am so inclined, it's reasonable to predict that the computing landscape will be different. In the technology world, where things move so fast, sometimes it pays to slow down and wait to see what's coming.